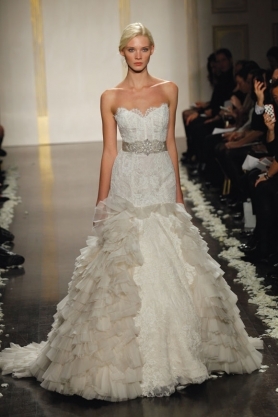 LAYER ON: The timeless silhouette gets a modern upgrade with Alvina Valenta’s “9208” dress. The light-as-air, cascading silk organza skirt adds movement, but it’s the pleated bodice, jeweled floral detailing, and sheer capelet that give the dress enduring beauty. $3,738, Mon Amie Bridal Salon in Costa Mesa. LOVELY IN LACE: The organza ribbon lace of Elizabeth Fillmore’s Elena, with a strapless sweetheart neckline and trumpet skirt, telegraphs romance, while the underlayer of blush duchesse satin lends a touch of modernity. Add an ethereal lace caplet (not shown) for a perfect two-in-one number. 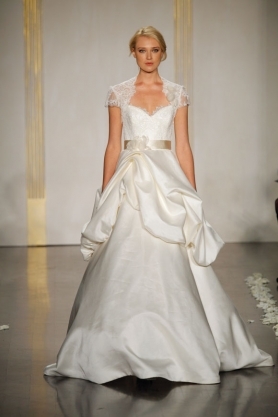 Capelet, $1,980, and dress, $8,470, Saks Beverly Hills and Erin Cole Couture Bridal in Costa Mesa. Haute Bride in San Francisco and Blush in Tustin. IN THE MIX:This Rococo-inspired, Alençon lace-covered Lazaro “3200” dress mingles a strapless sweetheart neckline and a classic chapel train skirt with fashion-forward flourishes such as a corseted bodice, silver moiré jeweled ribbon belt and pleated net godets. $7,920, Panache in Beverly Hills. Bridal Boutique in Alameda and Trudys Brides in Campbell.